For fans that were surprised by my effusiveness for Superior Spider-Man #30 in my last write-up, you’re probably going to think I’m either a hypocrite or schizophrenic for what I’m about to write. What I praised about Superior #30 is how by bringing back Peter Parker and eliminating Doctor Octopus an issue earlier than expected, Dan Slott and Co. reintroduced a status quo that I was once again interested in reading about. In the weeks leading up to Superior #30, I was clearly getting anxious about the direction of Spider-Man, with storylines about amnesia and Otto still maintaining control over Spidey’s body being teased, and in some cases, overtly suggested. I’ve been upfront about my total lack of desire in reading these stories, so I was ready to greet Peter’s unencumbered return with flowers and candy, regardless of the clumsy way he was brought back. But the events of Superior #31 have put things into a broader context, and I think if I had the luxury of reading the last two issues of this series one after the other, before formulating some semblance of a coherent opinion, my post from two weeks ago would have read much differently. Superior Spider-Man #31 is the comic book equivalent of an Olympic Gold Medal-winning high diver belly-flopping into the pool. It lacks the grace, style and intrigue befitting a storyline that I’ve invested a lot of time and energy into defending and praising. 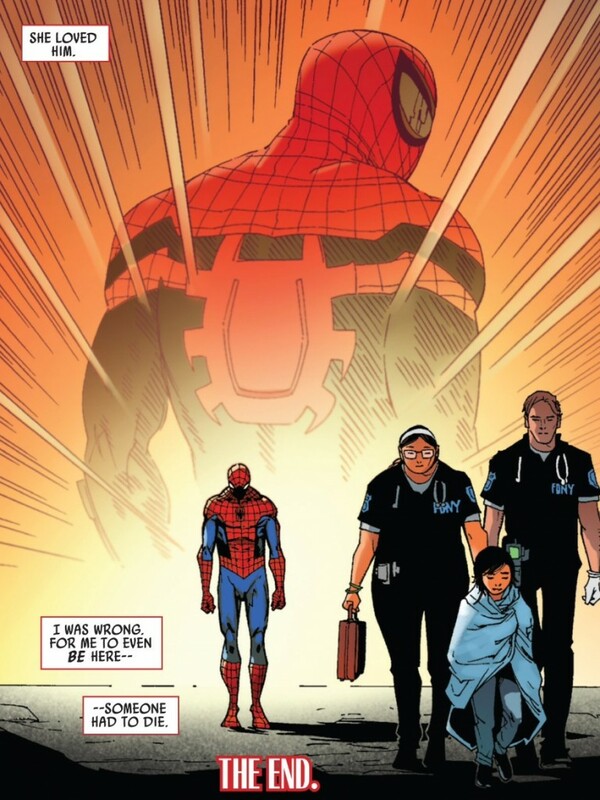 Even when I wasn’t totally on board with something Slott was doing (like the magical “31 memories” routine, or the over-abundance of story over character in most issues), I chose to see the positive because I had trust that once this thing ended, I was going to be left with my jaw on the floor. Instead, I’m shrugging my shoulders almost apathetically and wondering if Slott truly has the juice to carry the flagship Spider-Man book for as long as Marvel continues to give him full reign over this fiefdom. Perhaps the greatest flaw of Superior #31 is the way it wipes out all of the heart and consequences from the previous 30 issues almost as coldly and efficiently as Otto Octavius giving himself a “Parker-echtomy.” When Otto faded into the abyss last issue, tear in his eye, I wasn’t too upset because I figured Slott had one more surprise up his sleeve and the “Superior” Spider-Man would find a way into the final issue of his own series. Outside of the final panel of Superior #31’s first story, Otto’s presence is hardly felt, and even the emotional resonance of that image – a callback to “Spider-Man No More” – doesn’t land because of the clunky, heavy-handed text alongside it. Beyond a lack of Otto, Superior #31 is filled with moments that are just begging to be defining moments that are instead blown through like a sprinter not realizing he’s in a relay race by forgetting to hand off the baton. 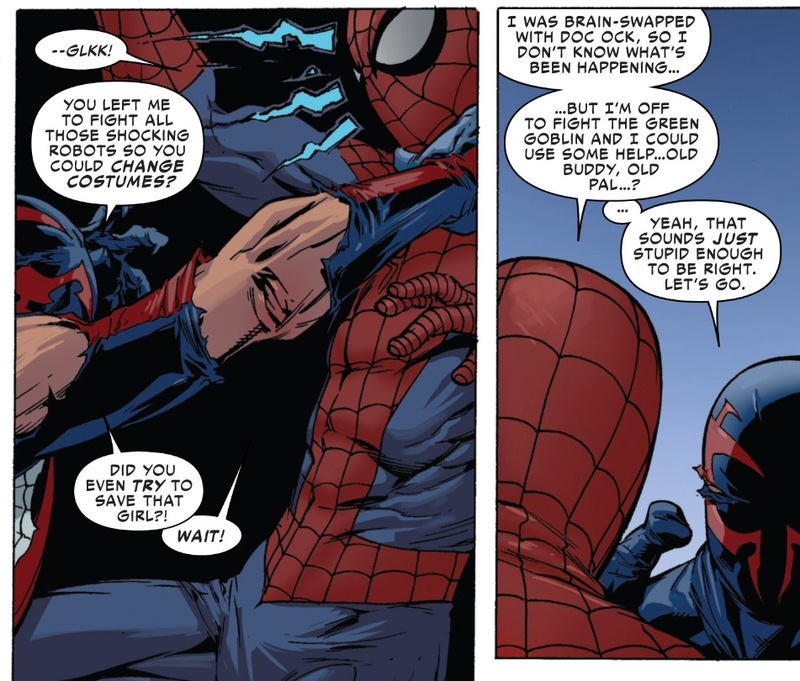 Characters such as Carlie Cooper, Miguel O’Hara and the Avengers, are way too accepting and/or indifferent to the fact that Spider-Man is telling people that the reason why he’s been acting so weird the past few months is because his sworn enemy Doctor Octopus has switched brains with him. Why aren’t any of these characters acting sympathetic, or incredulous in the face of these claims? Even in the world of superhero comics, it’s pretty outrageous to have your mind switched with a supervillain for an extended period of time. And while we’re at it, why does Peter seem so nonchalant about it – almost like he’s systematically working through his rolodex to invite his colleagues to the company picnic this weekend. Marvel has given us a series that has wreaked havoc on the life of one of its few uncompromised superheroes the past 16 months, and rather than give us a story of struggle and redemption, it has just hit the reset button and told us to ignore everything we’ve just been reading about. Outside of breaking the heart of Anna Maria Marconi, I cannot think of a single, legitimate consequence the Superior-era has wrought upon Spider-Man/Peter. If Marvel’s plan is to wait and address Otto’s mess once Amazing Spider-Man relaunches in two weeks, I think that’s a major creative misstep. At least use some of the extra-sized Superior #31 to let fans know that there’s trouble brewing. Sorry Marvel, but that’s just not all that compelling. And no, teasing Liz Allan and Normie Osborn as being somehow complicit in Norman’s master plan isn’t enough bait for me either. Superior #31 leaves us in a place where the Goblin is just waiting to strike again (and Spidey and Miguel casually let him get away to boot). The way things are going these days in the world of Marvel, I guess we’ll see his comeback around the time Chris Cooper dons the Goblin mask in The Amazing Spider-Man 3 or Sinister Six movies. 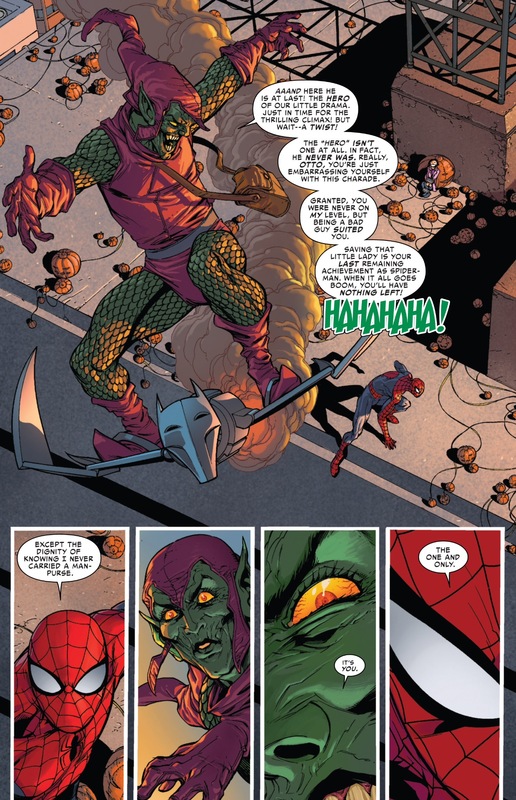 The final battle between Spider-Man and the Green Goblin features a number of bizarre moments. We get another callback to the “Death of Gwen Stacy” which is to be expected, but there’s one moment where Peter goes after the Goblin, leaving Anna Maria behind. When the Goblin calls Spidey out for this, Peter responds that Anna Maria is capable of taking care of herself … wha, wha what? This is coming from the man who was grandstanding with Otto last issue about always thinking quickly and doing the right thing? How many times in the span of a few months can Peter’s core characteristics be altered? I did find the Christos Gage-written “B” story in this issue to be far more interesting than the main tale. Similar to what he pulled off in the last Superior Annual, Gage gives us some interesting character moments involving Mary Jane and J. Jonah Jameson. 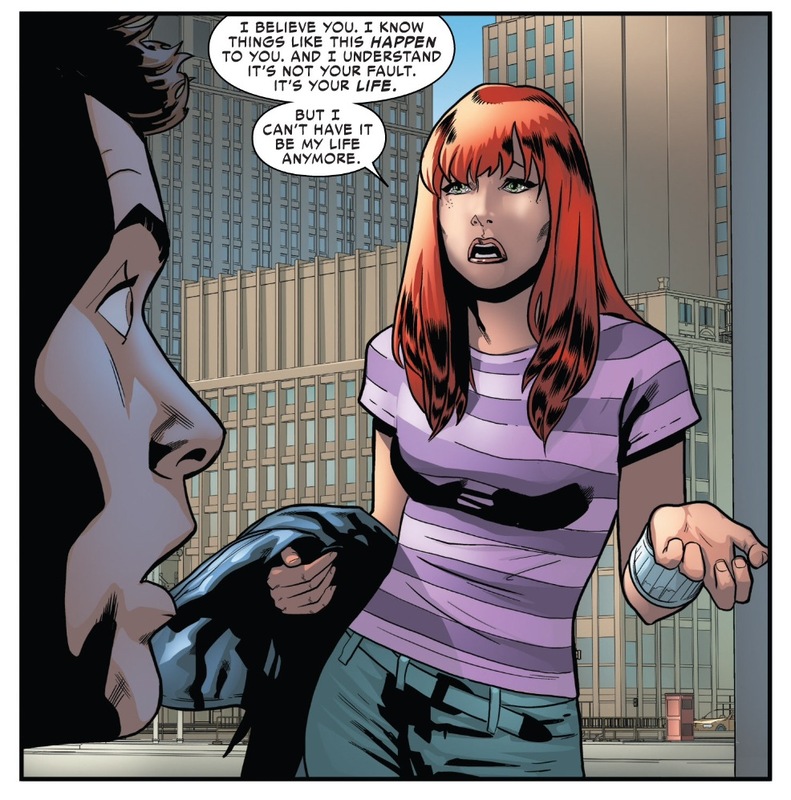 Those who are still holding out hope that Peter and MJ will one day get back together should probably just give up and pine for something else after what Gage wrote, but I did find Mary Jane’s reaction to Peter’s “reveal” about Otto to be the most interesting and realistic when compared to everyone else in this story. Jonah, meanwhile, is the one character in this entire arc who truly has to deal with consequences. His failure to oversee the Alchemax-created Spider Slayers has led to his resignation as Mayor of New York City. Where Jonah goes next is anybody’s guess, so at least there’s some potential for some different kinds of JJJ stories now that he’s been untethered from his political office. As much as I love the character, the potential of new JJJ is not a game-changer for me. Instead, I keep finding myself fixated on the fact that a arc I was ready to love and embrace and declare one of the “best ever” was instead just “okay.” The end of Superior was a letdown of great magnitude and one I suspect will have a profound impact on how I view and anticipate the next year or so of Spider-Man comics. Rather than getting excited or anxious when I read solicitations promising the return of “you know who” in ASM, or getting caught up in the hype of “every Spider-Man ever” in November’s Spider-Verse event, I’m resigned to being cautious and cynical. What’s it going to take to get a Spider-Man story that has a perfectly executed beginning, middle AND end, that also manages to serve the fans and the front office? I could have sworn that Superior Spider-Man was going to be that story; it was a major risk for Marvel to introduce at the time, but along the way Slott and his creative team made the concept endearing to both new and old fans. Little did I know that the one big thing missing from Superior this whole time was a clear exit strategy. I keep wondering if the odd choices that Peter makes are hints that Otto is still lingering in Peter’s head and we haven’t truly seen the end of the Superior Era yet. That is disappointing to hear that Superior just kinda ended like that. I thought part of the fun of Peter returning was to have him in a totally different status quo (ie. different relationships with his friends, Horizon being gone, or Parker Industries etc.). But it sounds like pretty much back to the same ol same ol. I agree with you on some points. Especially enjoyed the “no one dies” bit, but also felt the issue was kind of a whimper. Hell, my favorite part of this issue was the Slott/Allred Silver Surfer story. Couldn’t agree more. The whole issue felt like a rushed wrap-up after a series that was built on drawing this storyline out effectively. I was also hoping for a serious status quo change as Peter had to rebuild his relationships after Otto’s time in his skin, yet everyone just seemed to accept it way too easily. With that being said, I did love how Miguel reacted to the news, because in their world it completely makes sense. It is stupid enough to be real. However, for that same reaction to move across the cast of characters that Peter tells about the brainswap seemed like a cop-out. Obviously we will see more of this in Amazing Spider-Man #1, but this issue did fall flat for me as well. The biggest problem for me was the emotional void created by switching protagonists in the last act of the story. From an in-universe perspective, there’s nothing “wrong” with how Peter addresses the situation in front of him; actually, it makes a certain degree of sense that A) Peter’s ability to Monday-morning quarterback Ock, B) His different approach to problem-solving generally, and C) the Goblin’s MO to plot his schemes around emotionally destroying an opponent, which were targeting Ock, would all combine to give Pete a huge advantage. The problem is, Peter isn’t emotionally invested in the outcome of this issue, nor is there any reason for him to be. “Goblin Nation” could have been ANY super-villain scheme, and it would have had the same impact on Pete. Everything that the Goblin sought to destroy for spite was aimed at Otto, and with him taken out of the story, there’s no sense of any triumph over adversity. 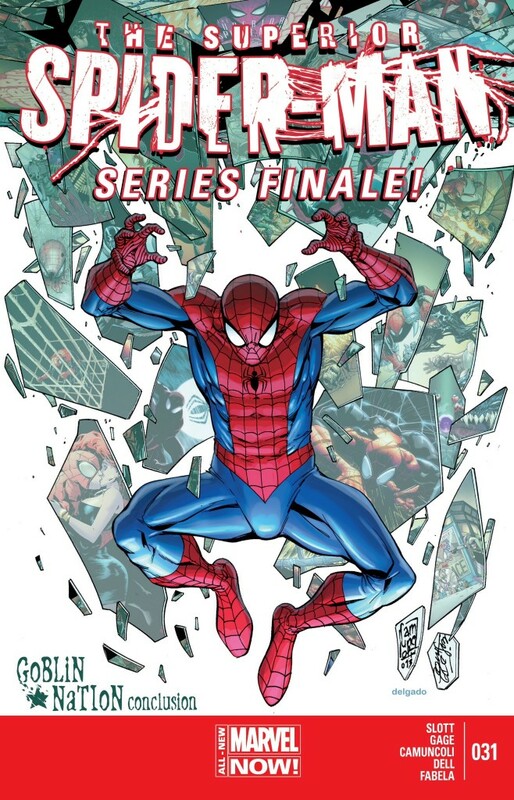 Essentially, the real “finale” of the Superior Spider-Man story was LAST issue, and this issue is just epilogue. Yet, it’s an epilogue that also happens to include the conclusion of the antagonists’ plans, which feels incredibly jarring. And I really wanted to like this issue more, because in the abstract, a lot of the thematic contrast works. On paper, this should be good. But in execution, it feels…heartless. To me this was the best issue ever, since hopefully it is the last of Spider Ock. There is a lot Peter will have to deal with in the next coming year from the fall out of Spider Ock. I am sure there will be repreccusions of killing Massacre, Norman, Parker Industries etc. I agree too much story not enough character. I really liked him being a part of Horizon Industries felt this was under utilized and the characters not fleshed out enough. During these Marvel retreats they should look at their own classics stories and learn more about characterization and plotting. 1 – People close to Peter discovering that he’s dead and having to deal with the concept of his loss, while still avoiding Otto realizing they know he’s not who he says he is. 2 – Peter struggling with the fact that he died/some sadness at having had his life stolen. 3 – Some moral complications on how to remove Otto and bring Peter back in the knowledge that they (whoever is involved in this) would be effectively Executing Otto who, obviously in the wrong, has done some good during his tenure as Spider-Man. 4 – A genuinely triumphant return for Peter, with real emotional weight. The confrontation between Otto and Peter in issue 9 was so good, I wanted that level of intensity again. 5 – The story to eventually become a cat and mouse game of Otto trying to avoid detection and others trying to find a way to prove what’s happened. I can see lots of interesting plot potential here. 6 – An interesting explanation as to why Otto’s body was gone from the grave. I was let down as well. The comic is unbelievably rushed. I was slogging through until I turned to the Goblin’s unmasking. Processing the page before reading it, I had a twinge of excitement because I interpreted the red hair and goatee to be those of Max Modell (I had forgotten what Banks looked like). 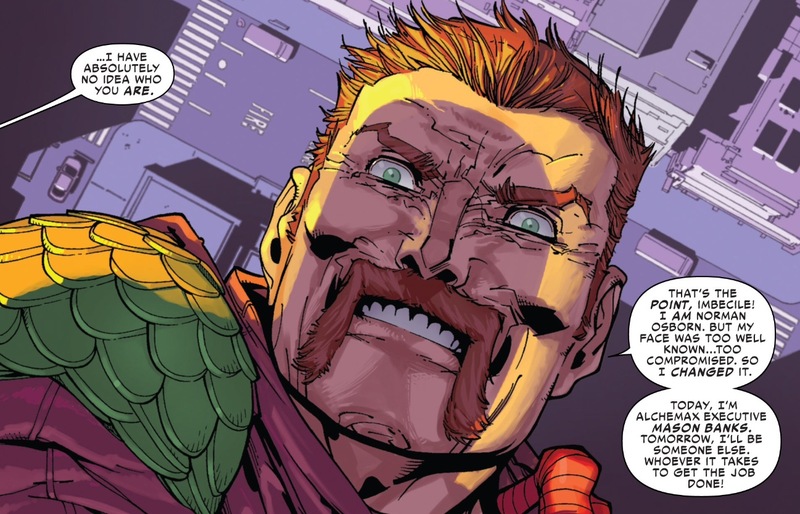 It hit me on a gut level, the idea of this father-figure for Peter turning out to be Spidey’s greatest foe, the whole enemy-in-our-midst idea resonating nicely with the original concept of the Goblin, while still having a novelty of its own. Of course, reading the actual page only led to more disappointment. I mentioned months ago that this issue would be my last floppy Spider-Man comic, for the time being anyway. While on the one hand, I would like to have ended my “Chasing” run on a high note, on the other, I do feel like Superior 31 perfectly vindicates my decision to leave. The fact that Superiors 30 and 31 are both scripted by someone other than Slott speaks volumes to the current mandate at Marvel. Like you, Mark, I had high hopes for Superior Spider-Man. You’ll recall my big dream of the series continuing to issue #33, ending on a parallel to Ditko’s famous “The Final Chapter.” I would not be surprised to learn even now that this was part of Slott’s original game plan. But reading Superior 31, or hearing Slott in interviews discuss the genesis of Spider-Island (Cliffs Notes: Slott cooked up Spider-Island over a weekend, because editorial was going to force him to unveil Dying Wish 30 issues before he had planned), I see that creators’ plans and visions are readily jettisoned for reasons which have nothing to do with story. I believe increasingly that the “perfectly executed beginning, middle, and end” you mention cannot happen under the present editorial mandate. While Marvel has been doing a lot right recently, especially in terms of hiring talent, I simply doubt they’ll ever have the patience or foresight to give us this generation’s Born Again. Well, at least Carlie Cooper is gone (forever maybe? Please?) but yeah, the ending was a let down. I just wish this tendency of Marvel to hit the reset button with Peter was less of a bore. Once again Peter is pennyless, Jonah hates him, Aunt May is pretty much the only one in his corner, he can’t get a break anywhere and every other hero in New York is wary of him. I’m simply so very tired of the “lovable loser” angle that I can’t find it in myself to care about Spider-Man anymore. Well, Superior was nice while it lasted, and it made me buy Spider-Man comics again since the OMD disaster. I guess it’s time to drop the Spidey books again. You know Mark I’m kind of surprised that you didnt notice how Slott gave us a battle between Peter and Norman that didnt involve any of that self doubt or regret we often see in these slugfests. There was no emotional ties to Peter, Goblin Nation was a plan directed at Octavious. With him gone Norman’s plan had no endgame. Spidey was able to fight clear headed for what could be the first time. Using Ana Maria didnt bring up any turmoil because Peter himself has no idea who she is, that’s not Gwen or MJ or Carlie on the bridge it’s a random innocent. Otto’s empire is crumbling but PEter could care less. He’s focused on one thing bring Norman down once and for all. While the other bits really needed fleshing out, it was this key interaction between two hated rivals that saved the main story for me.